ELIZABETH CITY, NC – As you think back on 2014, do you find yourself wishing you could've driven through the year in a better ride? Well the countdown is on until the new year and it's time to start 2015 off right! We're celebrating with Chevy's Year End Event which means you can take advantage of 20% Cash Back on Chevrolet Cars near Virginia Beach, VA! We want to help you end the year on a high note, and we may be biased but if you ask us, there's no better way to do that than with that new car smell. You can start the year off fresh in a brand new vehicle with the latest technology and safety features, AND enjoy 20% of MSRP cash back in your pocket! This is like nothing you've ever heard about – 20% Cash Back on Chevrolet Cars! This offer is only available through the end of the year, so we're calling all of our friends from Virginia Beach, Va to Raleigh, NC to take advantage of this unheard of vehicle offer from Chevrolet! 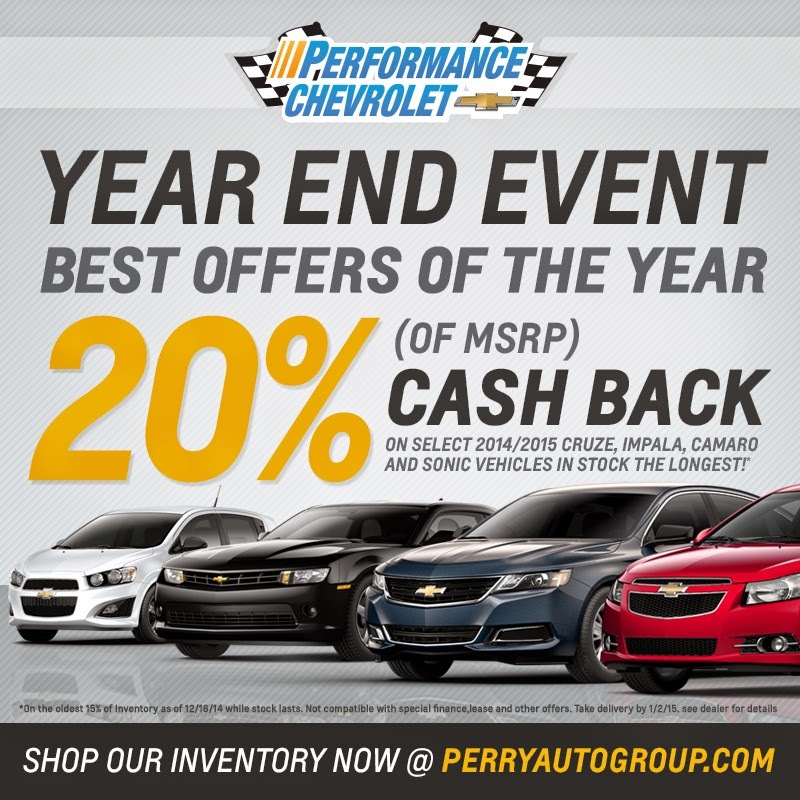 Don't miss the chance to get 20% of MSRP cash back on select 2014/2015 Chevy Cruze, Impala, Camaro, and Sonic vehicles in our inventory! Ultimately, we want to help make your life easier. So we are here to help you solve your auto needs, whatever they may be! Perry Auto Group has two dealership locations to serve you better at 1005 W. Ehringhaus St, Elizabeth City, NC, 27909 or 1001 Halstead Blvd Elizabeth City, NC 27909. Stop in for any of your auto or community needs, or feel free to give us a call at (252) 338-9100.